Update (4/1/12): Since the crash, I’ve been looking into the issue. It turns out, there was a recall in 2005 because the bolts were too short, and the Trail-a-bike unit could fall off, which sounds awfully familiar. I bought ours from Recycled Cycles in 2009, so it’s certainly possible that it was a recalled unit. The mechanics there couldn’t find a clear way to tell, but intended to replace the hitch before selling it. Anyone buying an Adams at this point is very unlikely to have this problem, but it’s certainly possible. As in can’t lift off the ground, got a broken wing (NOT a broken bone, luckily enough). Since I joined the Loop Frame Love collective last spring, I’ve been writing about my adventures riding with my son, Spencer, now 6. We’ve been using an Adams Trail-a-Bike attached to a mountain bike for the past 2-3 years. My son was scared to use it at first, since the seat was higher than his little 12″ wheeler. Plus, there is a noticeable side to side wobble to it, that I could not get get rid of, no matter how much I tightened the connections. So, we took it slow and practiced at the local elementary school, which has a big paved area. Spencer gained confidence quickly – when he started yelling “Go faster, Mommy!”, I was pretty sure that we’d gotten the hang of it. We took it slowly the first year, sticking to multi-user paths in nearby parks. Last summer was a big step for us, as we started to use it a lot for trips within the neighborhood (about 2-3 miles round trip) and slowly venturing beyond that to perhaps 4-5 miles total. It’s been fantastic to be able to combine family time with an activity that I love. It also makes trips to the library and the store an adventure, rather than just a series of errands. I’ve had rather mixed feelings about the Trail-a-bike itself, though. The relatively low price got us into family biking. Cargo bikes and Xtracycles were not even close to being on my radar at that time and I would not have spent that kind of money. It allowed us make the transition from occasional recreational use to weekly, though not daily, transportation use. I eventually asked about the wobble at a bike store and was told that it’s a characteristic of the joint. The universal joint does make it easier to take a tighter turn. However, that plus the wobble, has always meant that Spencer’s motion can swing the balance of both his bike and mine. He’s generally pretty good at staying upright, but will occasionally get spooked if he thinks we’re getting too close to something. He’ll then lean hard the other way, once even shouting “Mommy, I saved us!”. From a parked car, no less. I’ve never fallen over, but I’ve certainly had to quickly put my feet down and grab hard to hold us upright. A nearby friend of ours has an upstairs office that looks over the street, and he’s teased me now and then about the path we were weaving down the street. It’s pretty clear why I avoid bike lanes where we’re squeezed between fast traffic and parked cars, eh? The ability to take the trail-a-bike on and off does have some advantages – it allows me to put it on the car rack and I have been using this bike on my own for transportation purposes. However, as I found, it also increases the potential for problems. Last fall, we had a spill. We were riding home on a quiet street, when I could feel Spencer lean one way. Then, a crash. I looked behind me and, to my horror, Spencer and the trail-a-bike were on the ground. I rushed over, helped him up, and did all the parent checks (Where’s the blood? Can you move your arm? How about your leg?). A kind passerby picked up our bikes and moved them to the corner. A woman who lived nearby ran out with a bag of frozen peas. The final tally – a scrape on his elbow, a good scare and a big scrape on his helmet. When I looked at the bikes, I was dumbfounded. All the pieces were intact and, as far as I could tell, undamaged. But separate. How could we have ridden 3-4 miles without it being properly attached? The only explanation I could come up with was that it must be possible to put the hitch most of the way in so that the locking pin passed at the end, but not through the holes. The friction must have held it in until it received a sideways tug. We picked up the pieces and slowly made our way home. I promised Spencer that it wasn’t his fault, he hadn’t broken the bike, and that he could pick out any helmet he liked the next day. We did continue to use the trail-a-bike. I added a sideways tug to my pre-ride check to make sure everything was secure and wouldn’t come out. Then, two weeks ago, it fell apart once again, this time while making a turn. As we were picking up the pieces and checking for injuries, two friends rode by on their bikes. They stopped and helped me search the intersection for missing pieces and debris. Once again, we were lucky that we weren’t hurt beyond a couple of bruises and scrapes and that there were no cars nearby at the time. I have not been able to find any mechanical damage. It could be my error in attaching the hitch. But, I have been using it for over 2 years now AND I’ve made checking the hitch part of my routine for months. If I can make a mistake under these circumstances, there is one hell of a design flaw. We will not be using it again. So, until I find a replacement that I’m happy with, we’re grounded. We visited our families in Canada over Christmas. It’s always great to see family (though we won’t talk about the trip itself). We were lucky that the weather cooperated – daily highs were about 20F/-5C, which meant we were able to have lots of fun playing in the snow. Still, we were more than ready to get back on our bikes by the time we returned to Seattle. Well, at least I was ready. And Spencer could be bribed. He was very excited to wear his new Lightening McQueen racing suit, courtesy of Grandma & Grandpa (step away from the Disney store and no one will be hurt….). Future cyclist of the month? While I hooked up the bikes, Spencer practiced his cool Jedi moves with the bike flag. The goal of today’s outing was to enjoy the outdoors and get a couple of treats, so we stopped at a local pocket park. We met an senior citizen doing tai chi in the park, who asked about the trail-a-bike. Then, a couple of twin 8-year olds arrived and gave Spencer a spin. For the record, I don’t make Spencer wear his helmet at the park – he loves it and won’t take it off. After we were finished at the park, we continued to the commercial district of Ballard. The bakery was closed, so we couldn’t buy bread. However, we could console ourselves with treats at Cupcake Royale. Aside from yummy cupcakes in many flavours, they make some of the best lattes in the neighbourhood. Given the high cupcake to mile ratio, I’m not certain if this trip was a net positive, health-wise, but it was very tasty. This was eaten while wearing a bike helmet. We’re very safety-conscious. The nice weather brought out many other cyclists, as you can see by the full bike rack at Ballard Market, a local grocery store. This is a sweet rack – sturdy, lots of capacity, sheltered from the rain and close to the door. However, our rig is a little bit long and stuck out into the parking lot, so I thought it would be wiser to park at the plain, but functional rack that is further to the side. Upon leaving the store, I was delighted to see a Little Tyke parked at the bike rack. I believe that counts as active transport by anyone’s definition! Particularly for the parent, who probably had to push the kid home. All in all, it was a terrific start to 2012. Happy New Year! Kidical Mass rides in Novembrrr! After following the Totcycle blog for a couple of years, I finally had a chance to join his Kidical Mass ride last week. The occasion was the grand opening of the Ship Canal Trial. It’s a great piece of bike infrastructure as it lets people get from Magnolia and the Ballard Locks to the Fremont bridge, without having to take a confusing and not-particularly friendly interchange near the Ballard Bridge. The forcast was for chilly, with a possibility of rain and/or snow. Chilly by Seattle standards, of course, which translates to 35-40F (2-4C). I hadn’t taken Spencer for a winter ride before, and I was a little concerned about how to dress him. I started digging through the closet to find last year’s winter gear. The snow pants fit great, but were probably unnecessary. Tried to find toques without pompom that would fit under bike helmets. The good mitts were left at karate class. And Spencer’s winter coat looked awfully short in the sleeves. This is when I began to feel like a lousy mother and a lousy Canadian. Didn’t I know that winter was coming? Has it ever skipped a year? In the end, the best solution was to wear last year’s coat and a warm pair of my mitts that were long enough to cover his wrist, even with the somewhat too short sleeves. Extra sweaters, scarfs and toques were added, I packed the pannier, and we were ready to roll. When we got to the end of the driveway, it became clear that I had overreacted and we were both terribly overdressed. So, we stopped to strip off layers, and my pannier was then stuffed with fleece for the rest of the day. Still, I’m glad we had the mitts and scarf – little bodies get cold quickly. Especially, when they don’t help much with the pedaling. Finally, we were on our way and were only a little bit late to our meeting place at the Ballard Library. Spencer was ready to go. Despite the chilly weather, there was a great turnout. I didn’t get a complete head count, but suspect it must have been about 40 people. And the bikes! There were at least three Madsens, one Bakfiet, a couple of trailers and two trail-a-bikes. Clearly, this was a very bikey crowd. We rode west on NW 57th St., one of our candidates for a neighborhood greenway. It’s always fun riding with such a big group. We can chat with folks, admire the different bikes and swap stories. Of course we’re still careful about traffic, but we don’t really have to worry about visibility with a group of this size! We took 28th Ave NW and then Market St. to the Ballard Locks, where we had to dismount to cross the canal. There is no denying that this was a production. The walkways across the locks are relatively narrow – there’s just enough room for a bike and pedestrian to cross each other. A group of cargo and family bikes takes a long time to cross. Fortunately, traffic was very light – there aren’t many tourists out on a chilly November morning. The locks were still pumped dry for their annual maintenance. We could see a few folks working away at the bottom, which gives a sense of how big it really is. The barnacles clinging to the wall were starting to get rather stinky by this point. It didn’t seem to bother the crows and gulls, though – they were still enjoying their sushi. See the three white dots? Those are the workers in their white hard hats. After many photos and three separate bathroom breaks, we were finally ready to continue on our way. We rode along Commodore Way and through Fisherman’s Terminal. It’s a light industrial area without a bike lane, but the road is relatively wide and there was hardly any traffic. We arrived under the Ballard Bridge just in time for the opening ceremony. A good sized crowd of cyclists and walkers had gathered by this time. Peter Hahn, the head of SDOT, gave a speech and cut the ribbon with very big pair of scissors. However, for our group, the big attraction was Julian’s thermos of hot apple cider to warm those chilly fingers. Before too long, we were on our way. I don’t have any photos of the new trail, yet, but there’s a nice one here. It’s a pleasant ride that I’ll definitely check out again and will be my preferred route between the Pier 91 trail and the Fremont Bridge. However, there is a rather annoying double 2-curve to cross the train tracks. I know they need to slow bike traffic down and direct folks to cross at a right angle, but this really seems excessive. Still, it’s a minor flaw in an otherwise great trail. After crossing back across the Fremont Bridge, we split up to get food and then met again at the Fremont Brewery. This was my first time there, and I’m delighted to discover such a cool place. It’s a local microbrewery which makes absolutely delicious beer. It’s a tasting room, not a full-fledged bar and they don’t sell food, but allow you to bring your own it. It’s really a big room with picnic tables at one end and big, shiny vats at the other, but seemed cosy and friendly. It’s also remarkably family-friendly – they even have a couple of baskets of toys! Only in Seattle. Sadly, I have no good photos from this part of the trip, so you’ll have to take my word for it until you can go there yourself. After food, a beer and lots of chatting and tracking down stray children, it was time to go. We’d had a full day and I knew we were in the pre-melt down phase. Plus, Spencer was getting tired too. We weren’t the only ones who’d had enough. Thirty seconds earlier, this little guy had been flopped over the edge of his bucket seat. If only I’d been able to get my camera out earlier….. It was a great group and a terrific ride. I hope we can do it again soon! And I did buy my son a new winter coat the next day. 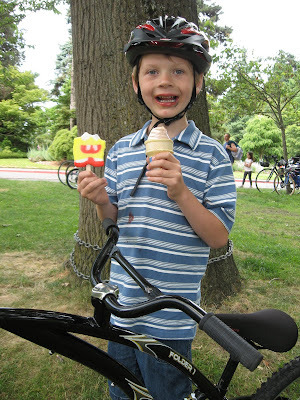 I just want to draw our readers’ attention to two great series of posts that have come out this summer, on riding your bicycle with your children: Full Hands has done a three–part series on family cycling, and Miss Sarah is writing an ongoing “Two On Tuesdays” series of guest posts for Simply Bike. Both these series do a fantastic job of showing that cycling as a family is fun and safe, and summarizing the equipment that’s available for different ages and stages to make riding with kids easier. Go read! Remember the adorable little mid-70s banana-seat Deelite that was going to take so much work to make roadworthy? A couple of Sundays ago, we took it in to EBC and turned it into a balance bike, with Coreen’s supervision. The genius of this plan is that it means no need to repack the bottom bracket or fix the coaster hub – and that it will help Audrey with her rocky transition from 16 inch wheels with training wheels attached to 20 inch wheels and no training wheels. Once she’s done we’ll give the banana seat a makeover to make it less girly, and it will become Dom’s. Coreen: “Wow, that bottom bracket looks even worse than Poplar’s!” I doubt that somehow, but it is pretty dessicated, and when I smushed the rusty granular goop together in my hand it was the consistency of that sticky putty you use when you install a toilet. That is not how grease should feel. After cleaning the bottom bracket out, I smeared a little Phil Woods goop in there to help keep it from rusting, then put the cups back in place. Those two holes you see above mean a pin spanner is required for the job of screwing and unscrewing the cup from the threaded bottom bracket, in addition to the bottom bracket wrench with three prongs for the outer ring. Yeah, I had never heard of a pin spanner before either. All done for the day. As you can see we also removed that rattly front fender, which involved taking the front wheel off entirely. Leftover parts, minus a few ball bearings. Yesterday I finished the job by changing both inner tubes, since neither of the old ones were holding any air, inspecting the rear tire that supposedly needed replacement (looks okay now that it won’t be a braking surface), and resecuring the no-longer-needed chain adjusters. I’ll have to get Coreen or Keith to take a look at the front forks, since I had to be really careful in placing the wheel back in there to find a position where it didn’t rub as it turned – I think something must be bent to be causing that – but it’s working okay for now and will fulfill its’ immediate purpose. And here it is in use! We fancied it up a little with a plastic front basket and some NOS Milton plastic streamers I found on eBay. Audrey is doing great on it – she says it feels really weird to be not pedalling – and in a few short days I think she’ll have enough confidence to graduate to her big-girl bike. She’s already working on building up a little speed and seeing how far she can coast without putting her feet down. PS: Oh look, our heroes at Chicargobike have already posted a summary of balance bike history and make-it-yourself instructions. On Sunday, Spencer and I set out on the trail-a-bike for a bicycle adventure. Bicycle Sunday is a program run by Seattle Parks, where Lake Washington Boulevard is closed to car traffic on summer Sundays. The weather was good and our schedule was clear, so we decided to try it out for the first time. Technically, this is not a panda shot since we are beside our bikes, not on them. Lake Washington Boulevard winds gently along Lake Washington with parks on one side and attractive houses on the other. It was a fun, family crowd, with trail-a-bikes, trailers, training wheels, and wobbly new-to-two-wheelers. Friendly people from the Cascade Bicycle Club were out, selling and fitting helmets for new riders. Neighbourhood kids had a lemonade stand. I don’t know how much business they did that day, but it was certainly a hit with my kid. Now, Spencer wants to set up his own stand, so he can earn money to buy more toys. Spencer: I could ask people for $5 for a glass of lemonade. Me: No one is going to pay that much for lemonade. Spencer: Well….what if I gave them lemonade AND let them play with one of my toys? The protected road ends at Seward Park, home to a very nice playground. Bicycle parking was at a premium! And, of course, we had to end the day with ice cream. Hey! I just asked you to HOLD my ice cream while I took a picture! I’d never gone to a Bicycle Sunday before, so I was curious to see how the experience compared to riding in the neighborhood or on the nearby trails. The combination of wide roads and the complete absence of cars created a remarkably relaxed and fun atmosphere. In comparison, the Burke-Gilman trail is quite narrow and, on a busy day, requires a lot of attention, especially when passing or being passed. Spencer is just learning to ride a two-wheeler (sans training wheels) right now. Once he gets a little steadier, he’ll want to move beyond the school playground, but won’t really be ready for streets or even the BG Trail for some time. Bicycle Sunday will be the perfect opportunity for him to spread his wings. All in all, it was a lot of fun and we’ll certainly go again. However, it will never be an every weekend activity – I’m not a big fan of driving 12 miles in order to ride for 3. Now, if only we could convince Seattle Parks to do a similar event in north Seattle…. To celebrate Earth Day today, Audrey and I went for a ride around the neighborhood. It was a gorgeous day, sunny with a cool breeze. The snow has mostly melted, and street cleaners have started to remove the winter debris from the roads in our neighborhood. Audrey dressed in purples to match her bike. We practiced signalling – Audrey is almost as good as me now – and also spent awhile practicing turns in the parking lot of her elementary school. She’s ready to have the training wheels pulled off her bike. Actually, she’s ready for a bigger bike. We’re going to see if we can get a bit more life out of this one by adjusting seat and handlebar height. Once she’s done we might cannibalize this bike to get the little blue Deelite working for when Dom outgrows his Tigger bike. I rode Eliza, the 1978 Raleigh DL-1 Lady’s Tourist that used to be Fiona’s. Everything except the skirtguards and basket is original. I haven’t changed anything on her yet, so the seat is still a bit high for me. The plastic trigger shifter has lost its adhesive label. I think I’ll get it replaced with the chromed SA shifter with a screw-on faceplate that came with Bert. I didn’t remember to look for marks on the Westwood (rod-brake-only) rims. Heron chainwheel, rear rod brake, pedals marked with the Raleigh crest. Both the headbadge (hidden under the basket) and the decal on the rear mudguard are marked Nottingham. Notice that the fenders have a rounded profile, instead of the ridged versions on Mary Poppins and Ms Trudy. since the nose on the B66 feels a bit long. Closeup of the OTT Simeli crocheted skirtguards. Eliza still needs a thorough cleaning and some lemon-and-foil to really make her shine, and I might touch up her paint where it’s been dinged – her front forks are especially scratched. At the advice of uber-mechanic Keith, I’ll be considering an imported Dutch centre stand (the kind that attaches to the back wheel) to allow me to carry a grocery-loaded rack – this is crucial for me, since I need Eliza to earn her keep as my errand-running bike, and installation of any of the other double kickstands is made impossible by the rod brakes. (It is possible to install the specially-made DL-1 Pletscher prop stand, or to grind down a prop stand and install it with a shorter bolt, but those solutions aren’t stable enough if you plan to carry heavy loads.). If I’m not happy with how the brakes feel after new Fibrax rod brake pads have been installed, rebuilding the rear wheel with a 3-speed coaster hub (like Velouria did) will provide secret stopping powers. As you can see behind me, in installing the (wave-style) bike racks at Audrey’s school in a sheltered location they managed to ensure they’ll be buried in a snowdrift after the rest of the snow is long gone. Oops. We spent most of the weekend in splash pants doing this. Dom’s getting really confident on his Tigger bike.